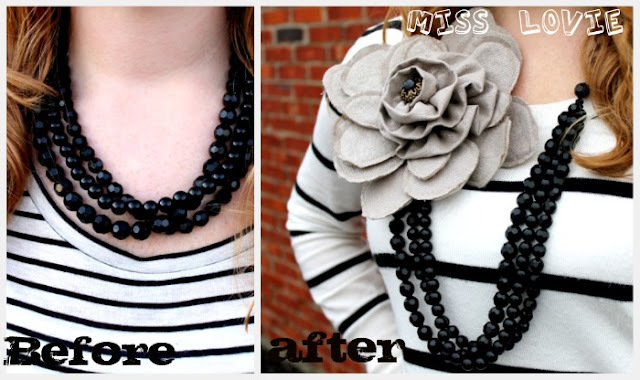 I hope you enjoy this Interchangeable Flower Necklace Refashion! Okay, so the name is a little long, but that's okay. I'm long-winded so it works. I've gotten lots of compliments when I wear this necklace. You will, too if you make one! The necklace on the far left is what I started with. I lengthened it and added a flower that is interchangeable! How much more fun is that necklace now! And you can change out the flowers to whatever you want!! I love multiple options!! 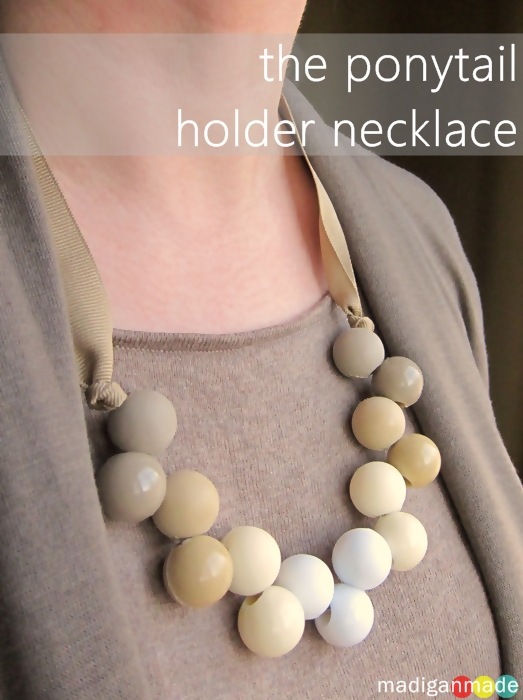 If you've been to my blog before you might have seen that I actually already refashioned this necklace earlier this week. Who would have thought I could do it again! 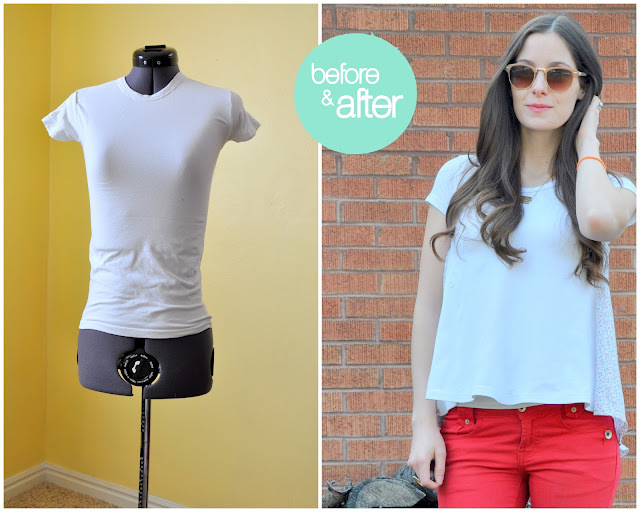 If you missed the first refashion, go check it out! The necklace that I started with had been sitting on its hook for years untouched. It was in good shape and had nice beads on it so I decided it just needed a redo. This necklace is very easy-even if you've never made jewelry before. 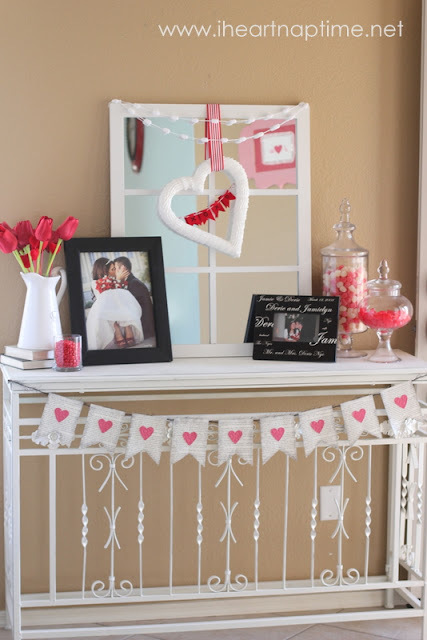 All materials can be found relatively cheap at your Hobby Lobby or Michael's store. 1. 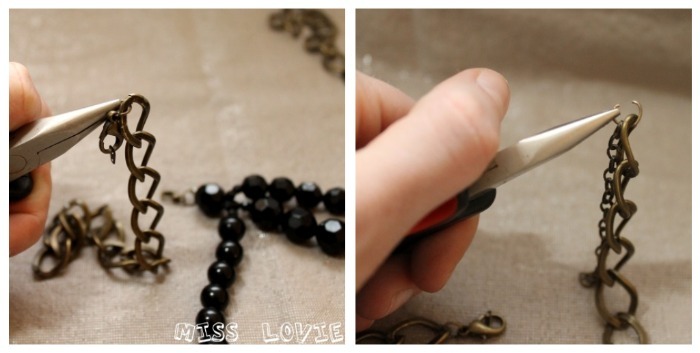 Take apart the old necklace. Open the jump ring by holding one side of the ring with one set of pliers and holding the other side of it with your other set of pliers and simply pull apart. Your bent nose pliers are thinner and easier to work with so I usually position my flat nose pliers in my left hand to hold the jump ring stationary and then I use my bent nose pliers in my right and let them do most of the work. 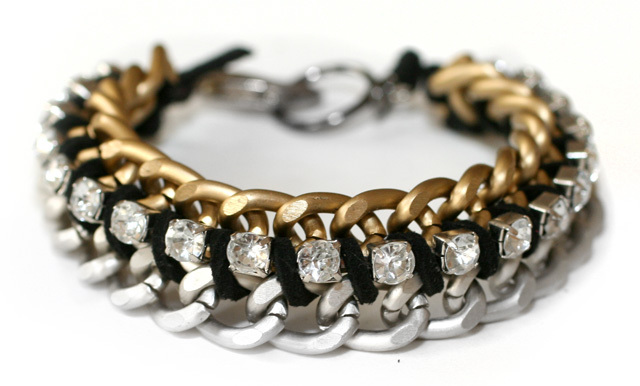 Here's my deconstructed necklace. I think I'll have to find something fun to do with that sweet little bow charm. Now open another jump ring and slide on one end of the old necklace and one end of your chain (whichever side you don't want the flower on) and close the jump ring back. 1. 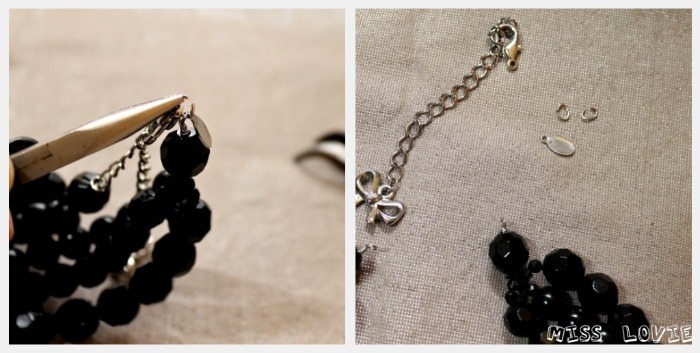 For the other side use jump rings to attach the other two lobster clasps to both the chain and the old necklace. These will hook to both top and bottom of your fabric flower allowing you to change it out if you want. 2. Attach jump rings to the top and bottom of your filigree. This is what you will hook your lobster clasps to. The jump rings will help your lobster clasp lay flat. 3. Hot glue the filigree to the back side of your flower and then glue the matching felt circle on top of it. Only glue on the middle on top of the filigree and out to the edges of the felt circles on the sides only. Leave top and bottom unglued as shown so the felt can be pulled back to reveal your jump rings. 4. Attach lobster clasp on the old necklace to the bottom of your flower and attach the lobster clasp on to the chain to the top of your flower. Now let the felt fall back and your lobster clasps are hidden! I like to wear my flower a little lower so that the necklace has an asymmetrical look to it. Also so the flower isn't all up on my neck. Ha! 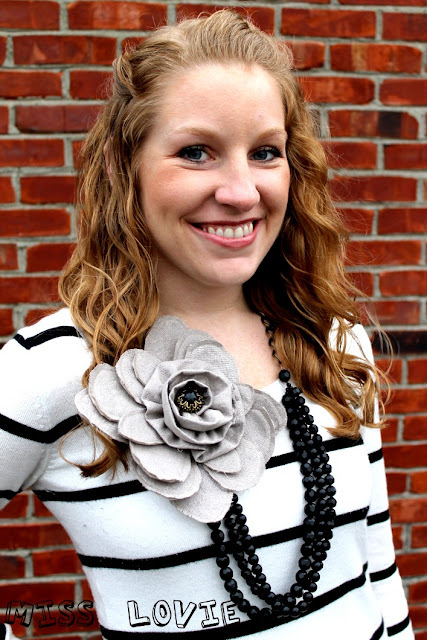 If you're interested in making this flower, go see my Chain Wrapped Rosette tutorial. This one is HUGE, but I love it. Who doesn't love leopard and old buttons? This flower is made using my Scrappy No-Sew Flower tutorial with black mesh in the middle. 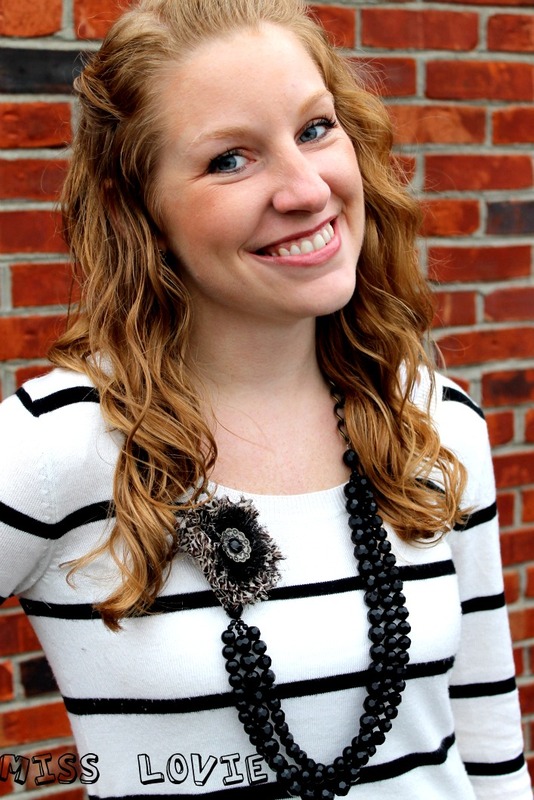 Welcome to this week's My Favorite Things Thursdays! It seems like these are the only kinds of posts I'm able to get together these days. Crafting is few and far between these days unfortunately. I'm hoping to get some in this weekend, but I said that last weekend, too. Sigh. Plans for the weekend: Research paper, more homework odds and ends, clean this crazy apartment and do a ridiculous amount of laundry, lesson plans, then craft. Hopefully the last thing on my list doesn't get pushed off the list! I just love this blog. Seriously. Every post is so great. What a fun and easy idea for little note cards. 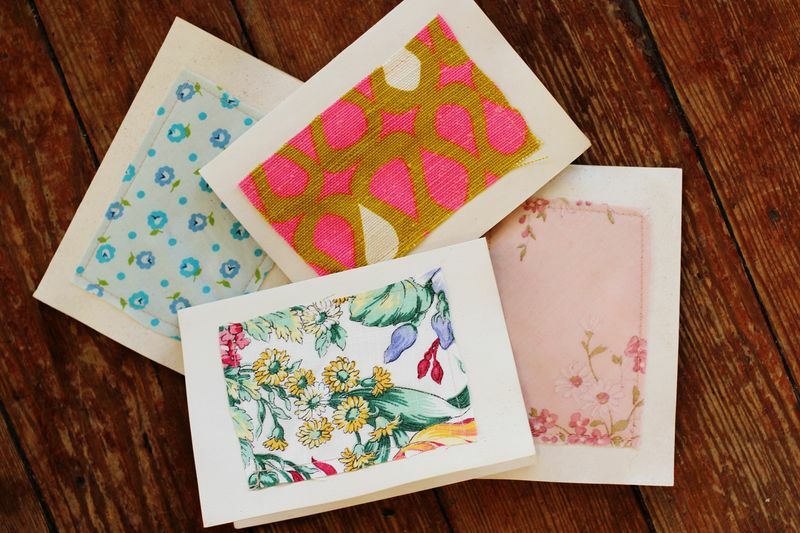 What a great use for fabric scraps, too, right?! This tutorial is great, too. I love covered buttons and those little kits can get super expensive if you use them all the time. This is a perfect, easy, and cheaper alternative! This might be one of my most favorite finds recently. I think it jumped ahead of several things on my "must try soon" list. 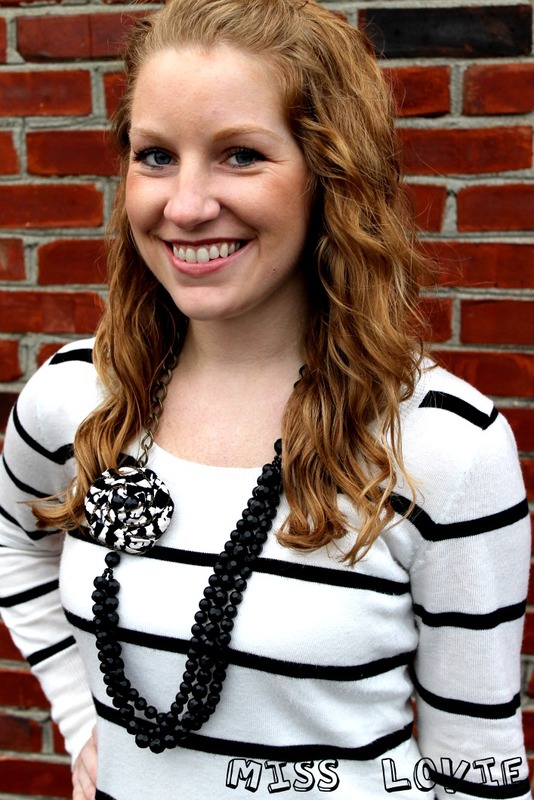 Lizzie uses panels of fabric sewn in to create this trendy flowy top. I love how the fabric is a subtle floral, too. Also, Lizzie, can I have your pants? Kate's Sewing 101 tutorials are always so great. I LOVE the look of exposed zippers. I can't wait to try this. JoAnn's has some great gold zippers right now that would be really great for this. 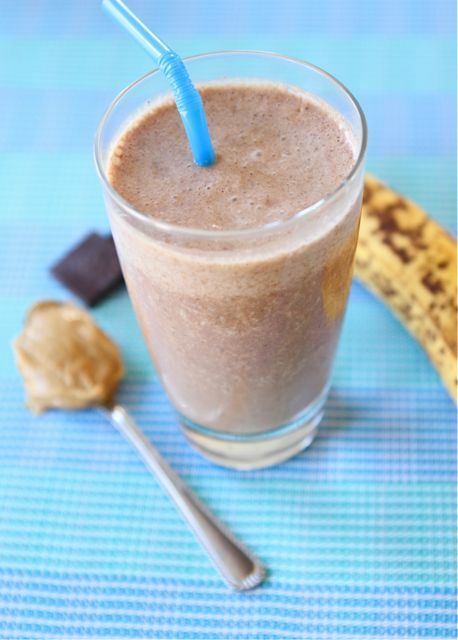 This looks like it would just be so incredibly yummy. I want it really bad right now. And she made hers with Almond milk. Mm. How delicious does this look! Wow! I love red onion on my salad so I knew I had to post this. 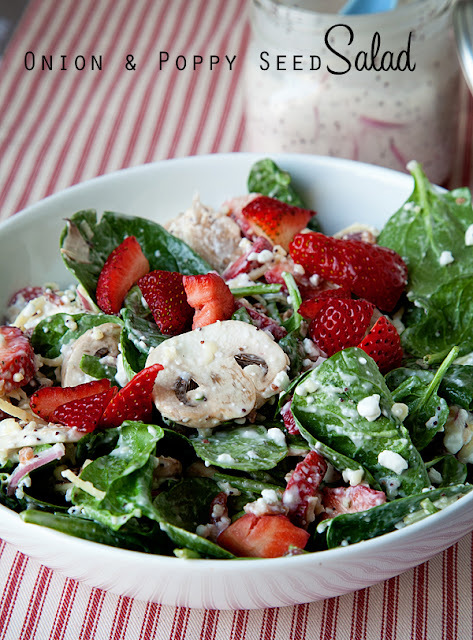 Those strawberries make me feel like summer can't be too far away. This past week was crazy so My Favorite Things Thursday did not happen. I'm super excited about this 3 day weekend we've got here, even if I still won't get much crafting in. More homework tomorrow. Yayyy grad school. I'm hoping to start an outfit post this week, though. So stay tuned. I hope you enjoy this special weekend version of My Favorite Things Thursday! Here's the wonderfulness I found this week! Are you drooling with me? What a gorgeous dress. I think I need one for me! No, really. 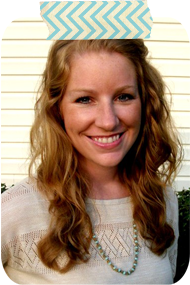 Be sure to go visit Jessica to check out the great tutorial and more beautiful pictures of that precious dress. The Lorax comes out March 2nd (or as we teachers know it as Read Across America Day and Dr. Seuss' birthday) and I can't wait to see it!! The Lorax is definitely one of my favorite Dr. Seuss books and the movie looks fabulous. 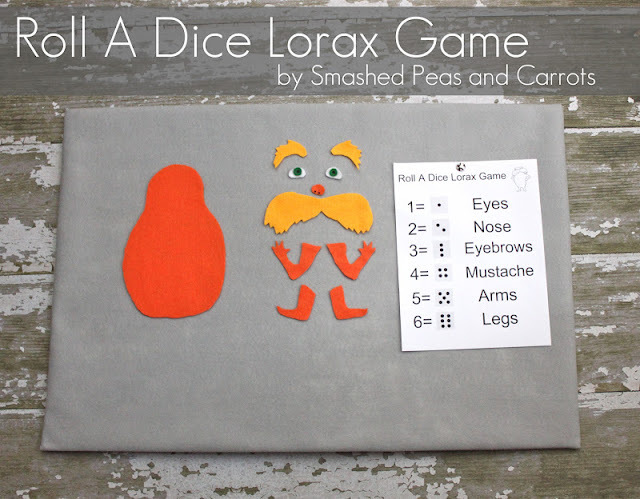 I think this game that Maggie made to celebrate the new Lorax movie is so fun. You've gotta click over and see the finished Lorax once the game is completed. It's super cute. Gorgeous. Just Gorgeous. Click over for the tutorial on painting, distressing. You should also see the before picture. I'm impressed with Desiree for seeing the potential in it! This might be my fave. 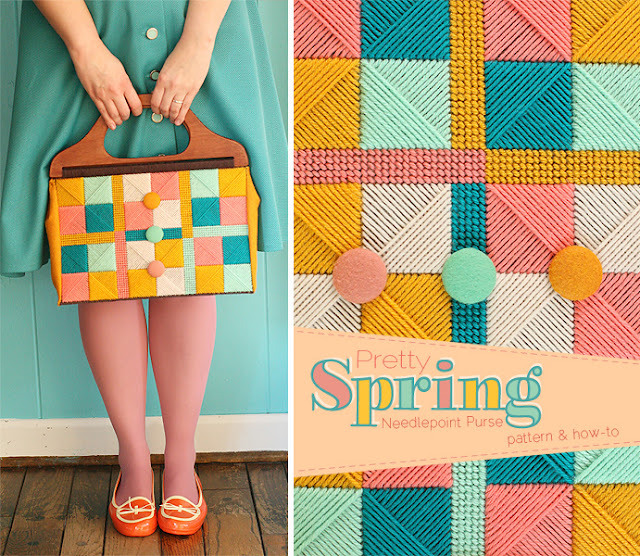 I've been looking for a tutorial like this for awhile (or figuring out how to making my own soon) and I was so excited to find it on Jenni's blog. This is a simple tutorial and it looks so fun on. I might be making this soon!! Delia has a great Nesting Series going on right now where she and guest bloggers are sharing some baby tutorials. You should definitely check it out! I'm in love with this cute little suspender dress. I love the fullness of the skirt. She also made another one with the same striped bodice but with a floral skirt. Super cute. What a beautiful ruffle clutch. The colors are so perfect, too. This will go with so much, too! Dress it up or down. She has a few other versions, too and a link to the tutorial on how to make the basic version. I swear, Katy comes up with the greatest ideas. Do you wear yoga pants as much as I do? Let's all make these. Think of all the fun variations you could do with the fold over part, too! Bright and cheery. Love the fabric choices. 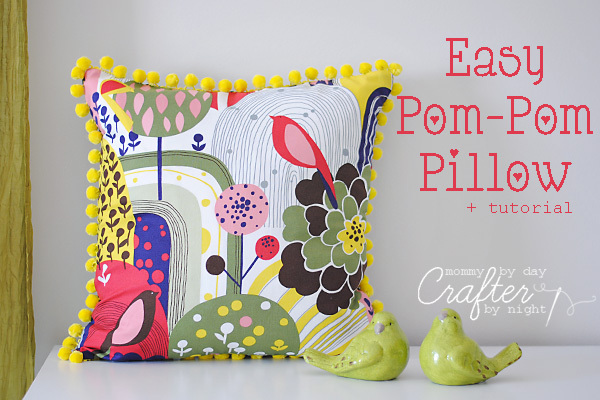 Click over to see the easy tutorial on this pillow cover! If you were featured, please grab a button! This is a little more personal than I usually get here on Miss Lovie, but I thought it was a fun idea so I figured I'd share it with you. 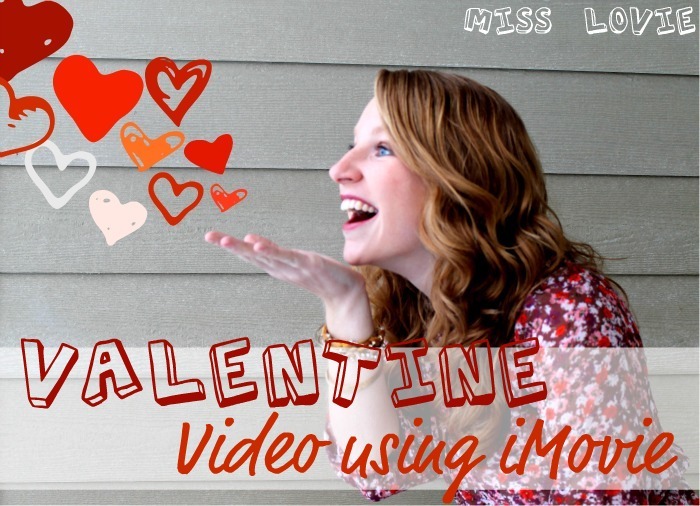 I made a Valentine Movie for Mr. Lovie. Plain old cards are so 2011. Just kidding. But this was really fun. 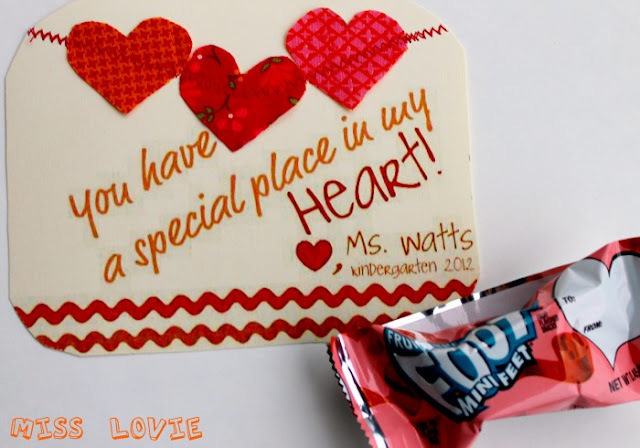 Mr. Lovie is really the best so I wanted to do something special for him for Valentine's Day (that was also low cost!). So while he was studying at school, I did a photo shoot with the tripod, got a little creative with picnik graphics, and played around with iMovie. Here is a shortened version of the Valentine Movie I came up with. Oh, and don't make fun of my cheesy photo shoot or "animated" hearts. I was going for cheesy, ok? Ha. I've used Smilebox before to make videos from photos, but you can't add your own music unless you pay more and you can't make it this personalized (unless they've changed things since I've used it). My original movie valentine was actually the length of the whole song because I had pictures of us in there, and more pictures of me with meaningful text. iMovie is really so freakin' cool. You can edit how your pictures transition, edit the music, add sound effects, record your own voice, and so much more. I'm excited to experiment more with it sometime again soon. I know, I know. Valentine's is over. Like, way over. But I promised I'd share so here we are! 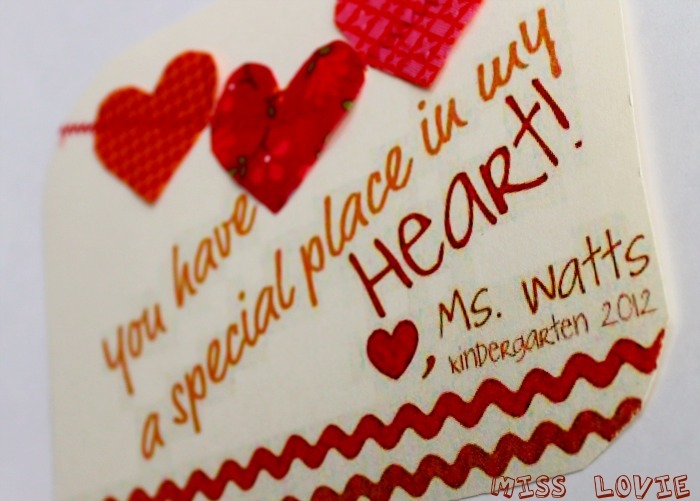 These are the valentines I made for my kinder kids in my classroom this year. They were too cute not to share with you, don't you think?! 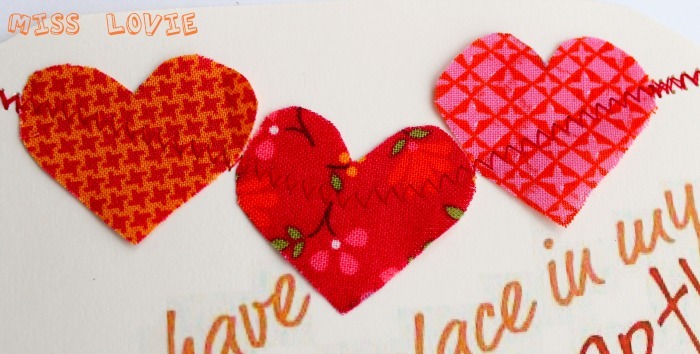 I simply made the printable on picnik and left the space at the top open for the fabric hearts. 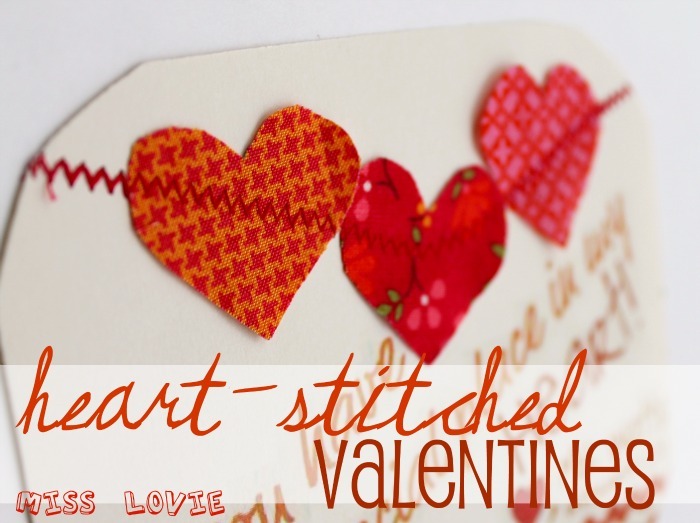 Then I printed them on card stock, rounded the edges, and zig zag stitched the hearts I cut from fabric onto them in a U-shape. Easy. And I had to include a treat. I was excited to find these Fruit by the Foots so I didn't have to give them even more candy than I knew they'd be getting already! Even though they're a week late, I hope you like them! I hope everyone had a great Valentine's Day! And a great week! 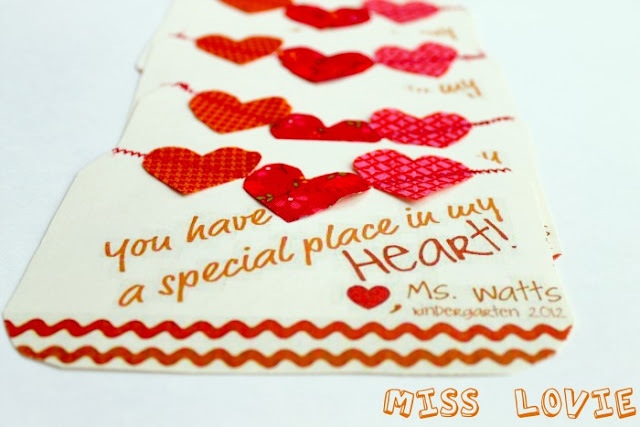 Here's a sneak peek of this year's valentines for my kindergarten kiddos. I just finished them tonight. I'll take better pictures tomorrow before I pass them out and share tomorrow night. In the meantime, here's the ones I made for them last year. These precious Girl and Boy Pirate Valentines printable and idea can be found here. What valentines are you using this year? I'll post more about my valentines for this year tomorrow! Sorry I've been so MIA lately. I've been super busy with grad school and teaching. I'm only a few weeks into my last semester of grad school and I'm so ready for graduation already. Whew. Thanks for sticking around!! I'm glad it's Thursday. Thursday comes before Friday. Friday=yay. Especially after this week. It has been especially exhausting. As always, though, my work week with kindergarteners brought funny stories. 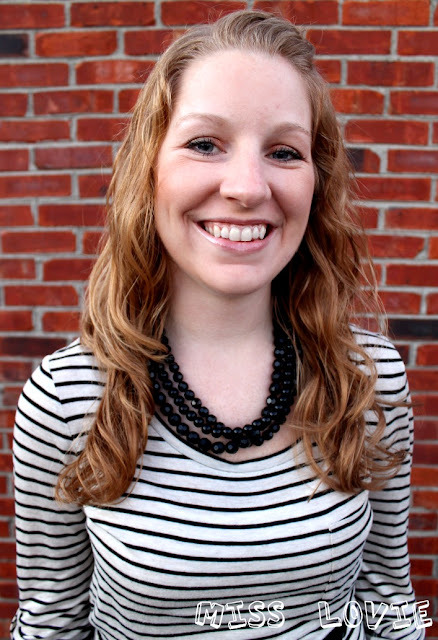 Read the latest ridiculousness that is my kinder babies at the bottom of this post! So I shared on my facebook and twitter that I am making some fun Valentines that I'm going to share soon, but they are still not done. I've been doing homework. And putting in grades for progress reports that go home soon. Nothing fun. I'll post the Valentines in the next couple of days, though!! Thanks for checking out My Favorite Things Thursday! Enjoy the great projects I'm loving this week! Oh. my. goodness. These are awesome. They're just grocery bags painted with some added paper details. LOVE them. 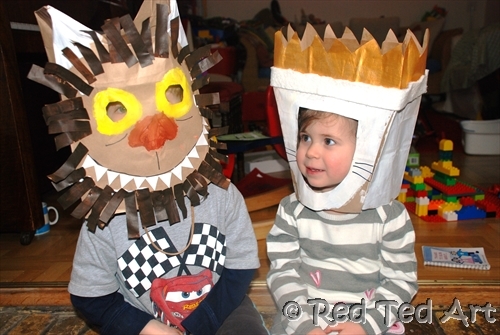 Love the Wild Things anyway, but this is just too precious. So creative. I love everything Shwin and Shwin does. 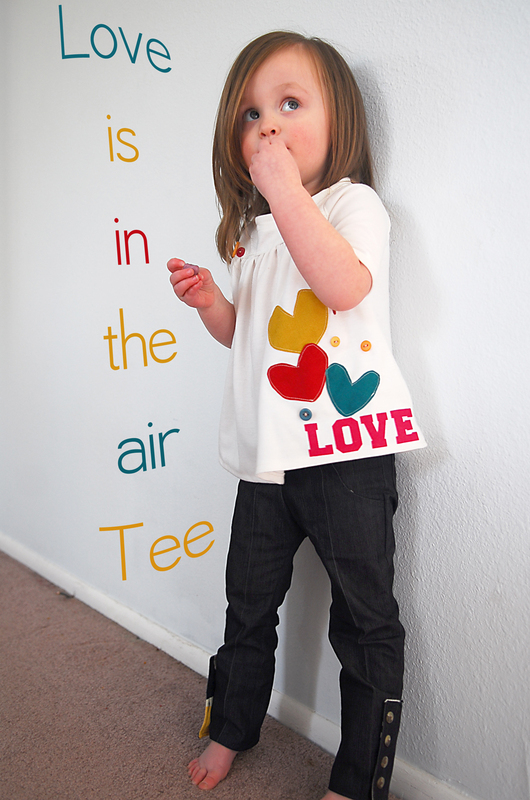 I think I pin pretty much every post she publishes, but I really love this sweet little tee. The colors are so great. I'm not the biggest red and pink Valentine's Day theme fan so this is right up my alley. How presh is her little girl, too? Did you just die looking at these? Me, too. Seriously they look so delicious. You gotta click over and see her cute packaging for them, too. How clever is Shannon at Madigan Made?! 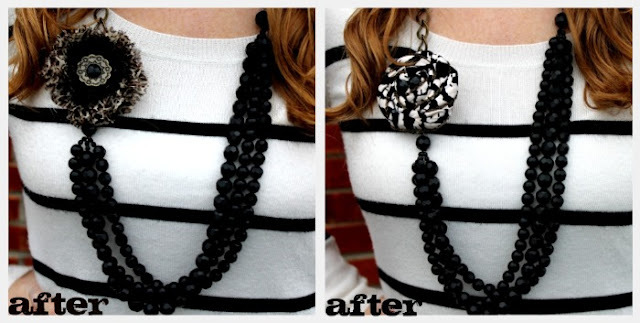 This necklace DIY is fabulous. 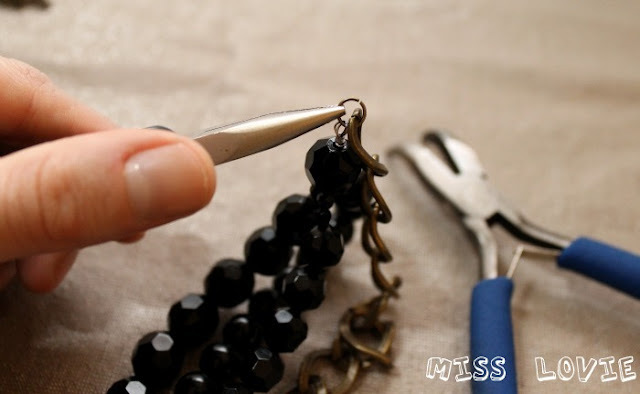 Click her link to see how she made dollar store ponytail beads into a really nice necklace. 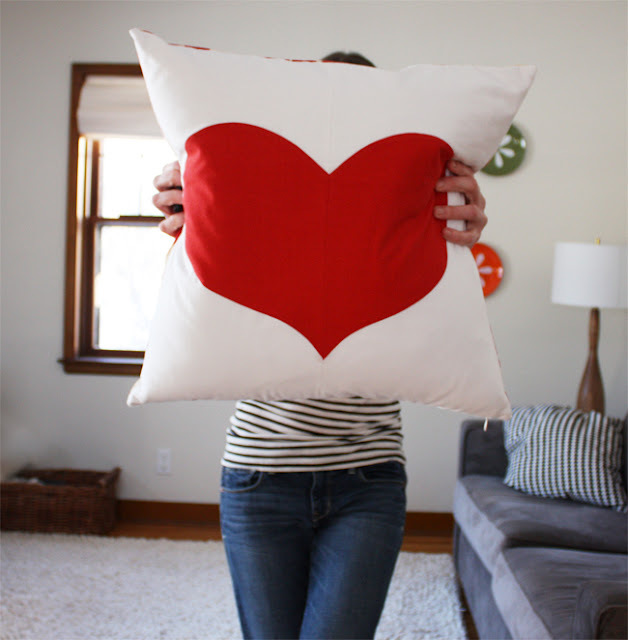 This pillow is so simple and fun. I just love it. Are you as much in love with this as I am?! 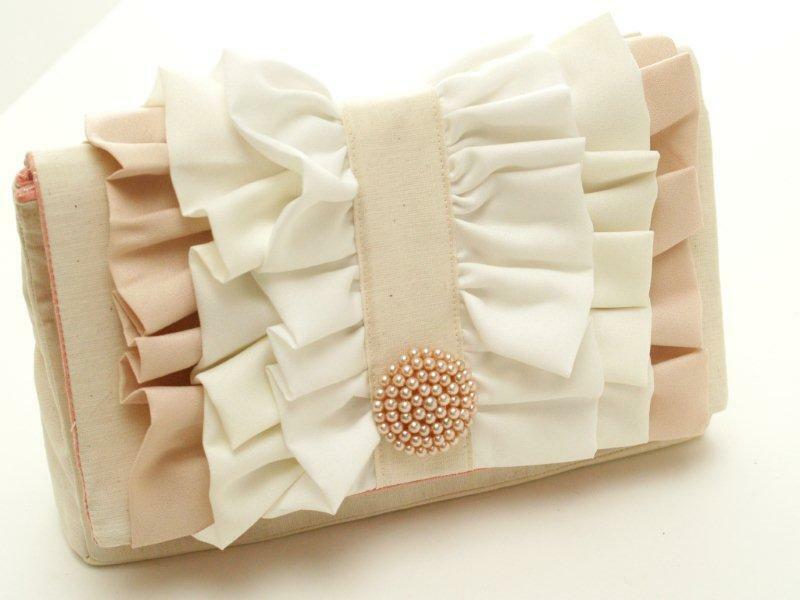 I don't think I would even carry a purse this fun. I think I'd just sit it on a shelf and look at it. The colors are so great. Mustard yellow with any other colors, yes please. 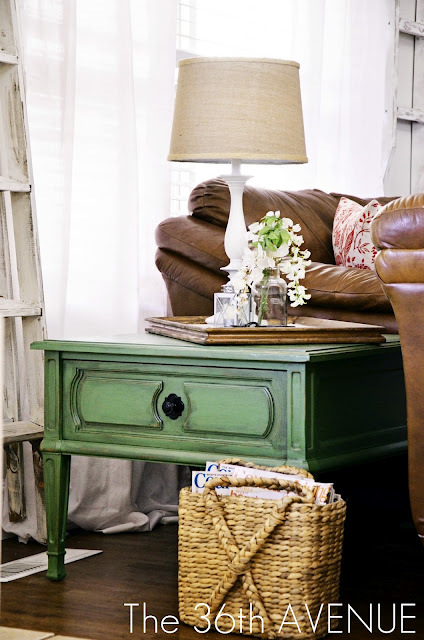 I just love the simplicity and sweetness of Jamielyn's mantel. The heart flag bunting is fantastic and I love the window pane with simple heart wreath in front. Her wedding pictures are, of course, perfect, too. A kinder students says to me yesterday morning: You know why I don't eat downstairs anymore for breakfast? Student: I found out their juice taste like bears. Me: What? Bears? What do you mean it tastes like bears? Student: No, Bearrrs. You know. The kind of bears my uncle drinks. :) Oh, that crazy cafeteria bear juice. Have a great Thursday. Thanks for reading. See you soon!